In 2013 we grew “Nigel”, a 7ft Dorset Naga plant. When Nigel was just 10.5 months old we harvested 2,407 red chillies from him. For details click here; for YouTube click here. How many chillies can YOU get off one Dorset Naga plant? This is a competition for chilli growers. This year, 2018, has been designated The Year of the Pepper. We are resurrecting our challenge to “chillheads” – dedicated chilli growers – to see who can harvest the most red chillies off one Dorset Naga plant. The Dorset Naga Challenge tests chilli growers’ skills like no other competition. 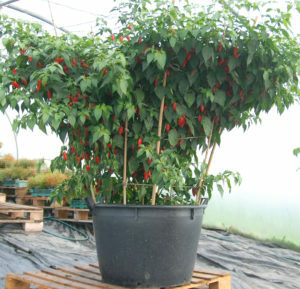 A single Dorset Naga chilli plant is capable of producing a couple of thousand chillies in a single growing season. But it is not easy to get such results, and depends on the skill of the grower and probably a little bit of luck. The winner – i.e. the person who harvests the most red chilies off their plant – will be given a £20 voucher to use on our website. If you want to have a go let us know, but don’t worry about making a commitment, this is just so that we can keep you informed of any developments. The competition is just for fun and among friends, so if you put your name down but change your mind later that’s fine; alternatively its ok if you grow your Dorset Naga plant, take your harvest(s) then let me know. 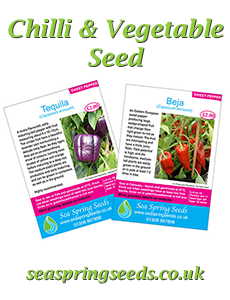 Anyone can enter: amateur or professional, serious hobbyist or someone who just dabbles in growing chillies. It is all just a bit of fun, so see what you can do and give it a go! The plant grown MUST be a genuine Dorset Naga plant. If you didn’t get the seed from us you will have to tell us where it came from, and convince us it really is Dorset Naga. There are a lot of fakes around and many people selling seed without permission, if you buy from these people your entry is invalid. The plant can be grown from seed or a plug plant. Any growing method can be used, i.e. it can be grown hydroponically, in a pot or in the ground. Only red chillies count. They can be picked at any time, but every harvest must be recorded or they won’t count. Last harvest date is 10th November 2018. The plant must be under one year old on the last harvest date of 10th November. This competition is based on trust. Keep records, take photos, do a video. “Nigel”, a 7ft Dorset Naga plant, produced 2,407 red fruit when he was 10.5 months old.